Shoes | Do We Love It? UGG Alternatives – Do we love them? Well hello there, kids! And Happy Holidays! And welcome back!! How’ve you been? I’ve been busy – busy making major life changes that I could not be happier about. Since last we spoke I’ve changed careers, moved to Atlanta, and wracked up many thousands of Delta Sky Miles traveling all over for this new life of mine. And today I’m coming to you from the beautiful city of Cleveland, OH. Seriously – it’s really nice. I can see why Lebron wanted to come back. Where it is FREAKING FREEZING! You don’t truly know cold until a 25 mph gust comes screaming at your exposed face and ears off of Lake Erie. It’s no bueno. When I mentioned the frigid forecast to my Mom, she said to remember to pack my “wool sock and snow boots.” Wool socks – check. Snow boots – um, no. I do now, and have always lived below the Mason Dixon line. Snow boots would be a huge waste of money for the 1/4 inch of snow my cities might get in any given year, and thus, snow boots are the one kind of boots I don’t have. So the warmest footwear I own are a pair of Uggs. Yes, Uggs. They’re hideous, but they’re warm, and so I have a love/hate relationship with them. And now that my friend Emily has referenced so not-so-kind things they do to animals to get that shearling they use in their boots (I didn’t and won’t link to the article, but it’s upsetting and, if true, makes me seriously reconsider supporting their company.). I did a little quick googling, and it appears as though L.L. Bean gets their shearling in ways much nicer than does Ugg. Which is good to hear, because I have long had a crush on the Bean Boot. It’s waterproof, it’s warm, and it’s a classic. It also comes in a non-shearling-lined version if you live in milder climates and just want to use them as rain boots/fun shoes to wear all the time. This is obviously a lace-up boot, so if you’re looking for something you can jump in and out of quickly, it might not be for you. And it’s pricey, but it’s about the same price as a pair of Uggs, but a much better splurge in my opinion. 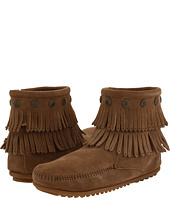 This one’s pretty much a Ugg look-alike at a more affordable price. It’s fleece-lined and water-resistant, and if you want the look and wearability of an Ugg, this is about as close as you can get. Cute little Ugg look-alike alternative with a twist! It’s a slip-on, so if you’re looking for something cute and comfy that you can slip quickly on and off at the yoga studio, the airport or at the end of the day at home, this pair will work. Best of all, it’s from Toms – so you know it’s supporting a company that’s good and not nefarious. Your mileage may vary, but I think these are adorable. They’re warm and weatherproof enough for even the harshest Winter climates, and I think they’d be super-chic with a pair of leggings, a big, comfy sweater, and a ridiculously huge scarf in an apres-ski kind of way. Now these obviously aren’t for climates such as the one I’m suffering through this week, but they have a side-zip for easy entry and exit, and they are cute. Sometimes cute is all that matters. So there you have it. Some Ugg alternatives for Emily, myself, and the rest of you who might be in the market – there’s still time to get them on your Christmas lists! But that’s what I think – what do you think?